Considering that we are barely fifty miles from central London here, the parishes of the Haverhill area contain some surprisingly well-kept secrets. Nearby are Cowlinge and Withersfield, and here the quiet and rather remote village of Denston is home to one of Suffolk's finest smaller churches. Apart from the older tower, this is all of a piece, built by the local Denston family in the 1460s as an act of late-medieval piety, and then subtly altered to serve a small college of priests about 50 years before the Reformation would sweep them away. 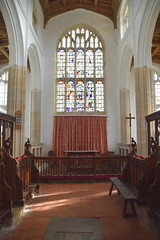 However, it was to continue in use as the parish church of a community too poor to lavish substantial restorations on it, and because of this it has a higher degree of surviving medieval liturgical integrity than virtually any other Suffolk church. It is a little sister to Holy Trinity at nearby Long Melford, and indeed it may well have been the work of the same architect, although far more has survived here than at Long Melford. It almost didn't, for as recently as the 1980s this church was in serious trouble, and it has taken the combined efforts of the Historic Churches Trust and the Open Churches Trust to bail it out. That they have done a good job can be seen as soon as you approach the building. St Nicholas is an exemplar of Perpendicular architecture in its purest form, without decoration or embellishment. The great clerestory rises cleanly above aisles that are more glass than flint. The doorways in particular look almost unfinished. The seven long unbroken bays to nave and chancel are not beautiful, but they are dramatic. 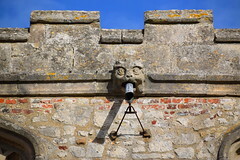 The only feature that breaks up the otherwise continuous lines is on the north side, and is a roodstair turret, as at nearby Haverhill, Clare and Stansfield. I will come back to this in a moment. Because of being built in a single go, there are none of the usual alterations and additions to ponder. Some of the windows were blocked up in the 18th century to conserve heat (you can see the same thing at Blythbugh and Sudbury St Gregory) but this has all been removed, except for the lower halves of the western aisle windows. 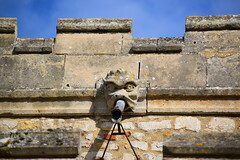 Looking up, there is a good range of jolly and fearsome gargoyles and grotesques. The buttresses and porch are almost entirely built of stone, most unusual in this part of England, but a mark of how no expense was spared to bring it here. You step through the original doors into breathtaking stillness. All about, tremendous medieval survivals spread. 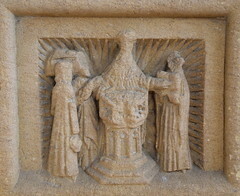 First, the Seven Sacrament font. 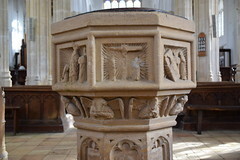 There are thirteen of these fonts in Suffolk, although three of them have been entirely defaced. 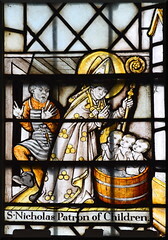 They were produced towards the end of the 15th century, and on seven of their eight sides scenes depict the sacraments of the Catholic Church. There seems to have been a move at this time, a kind of proto-reformation if you like, to assert the official doctrine of the Catholic Church against the superstitions and errors of the common people. 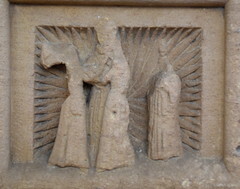 This was the time when it appears that wall paintings were covered over, as at Thornham Parva and probably Wissington, and the great roods lifted up to remind the people of the central mystery of the Christian faith - the death and resurrection of the Christ. This 15th century assertion of official Catholic doctrine seems to have been carried out under the instigation and patronage of the same families who would champion protestantism in the following century, and some of whom would be the puritans of the century after that. The only constant thread seems to have been their tenacious hold on secular power. The Denston font is in pretty good shape. It has rayed backgrounds like those at Great Glemham and Woodbridge, and was probably the work of the same artist, but the stone is actually quite different, being a pinkish granite that Cautley was satisfied had come from Aubigny in northern France. 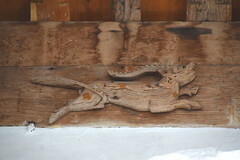 Probably, it was bought as a block and carved locally. 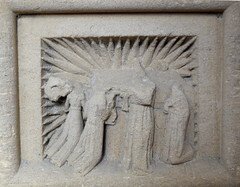 The panels from east clockwise are as follows: E: Ordination, SE: Penance (taking place in a shriving pew as at Woodbridge and Great Glemham), S: Mass, SW: Last Rites (with the bed curiously upright as at Woodbridge and Great Glemham), W: the Crucifixion, NW: Confirmation, N: Matrimony and finally NE: Baptism. 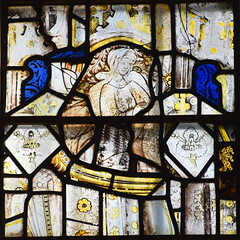 The Matrimony and Mass panels both show a woman wearing a butterfly headdress, which Mortlock says dates from between 1450 and 1485. Looking up, the 15th century roof is silvery with age, reminiscent of Blythburgh. 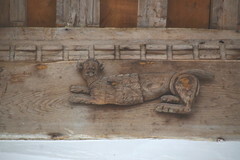 Animals scamper along the wallplates, stags, rabbits and lions. Above the font and the tower arch hang the royal arms of Queen Anne. Turning east, there is a nice 1480s brass of a woman in the middle of the nave floor. It is probably Felice Drury, one of the Drurys of Hawstead, according to Mortlock. Stretching away on either side of it, St Nicholas retains almost a complete set of medieval benches, their bench ends almost completely unmutilated. 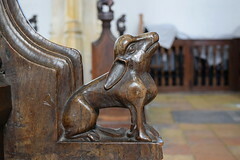 This is probably because, as at Woolpit and Tostock, the theme of the bench ends is animals, and appears to be secular. I say appears, because actually all these animals had a place in the medieval bestiary, and a lesson in the Christian life could be learned by understanding their behaviour. 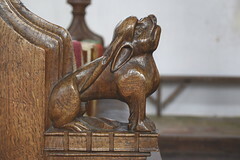 By the time the Anglicans started taking axes to bench ends in the 1540s, this seems to have been forgotten, or perhaps it was still acceptable at that time, and the puritans of a century later didn't mind animal decorations either. You can't help noticing that there are an awful lot of rabbits. Perhaps the workshop that produced them was good at rabbits, or perhaps there was a particular lesson to be learned from them. The only lesson I could think of from the behaviour of rabbits was not one I thought the medieval church would need to teach. 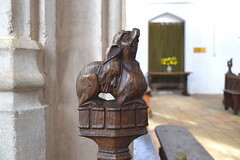 The most famous bench end here is the elephant. Now, elephants had trodden the lanes around here at the time of the Roman occupation a thousand years before, indeed, we are told that elephants were used in the occupation of the land of the Trinovantes, which included this part of Suffolk. At Camulodunum, modern Colchester, Claudius used a battalion of soldiers on elephant-back to establish his capital towards the end of the first century. Elephants may have been common in European court menageries, and may even, like lions, have been found in travelling circuses in this country. Be that as it may, we may safely assume that the carver here had never seen an elephant - or if he had, his memory did not serve him well. Rather, he was probably working from descriptions, witness the large flapping ears, the long nose, the big feet. 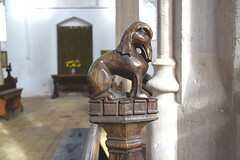 As with the giraffe at Dennington, the parts are there, but the whole ensemble is just not quite right. 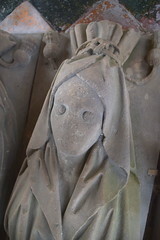 The only real curiosity is a beast that appears to have the body of a dog, or perhaps even a wolf (at least, its body is the same as an adjacent figure that I take to be a wolf) but the head of a woman, wearing a 14th century cowled headdress. Very curious. The rood loft and, of course, rood itself are long gone, but the screen stretches across the church from aisle to aisle, and the castellated rood beam remains, and looks as though it is an essential part of the structure of the building.Whether this is so or not, I do not know, but it probably dissuaded the reformers from removing it. There is something not quite right about it, and after a while it hits you, for the rood stair turret is two bays west of the east end, while the rood beam and screen are three bays west. Hmmm. 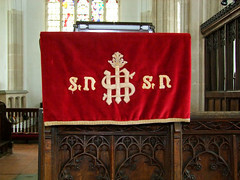 I don't think the screen has been moved, and the rood beam certainly hasn't. 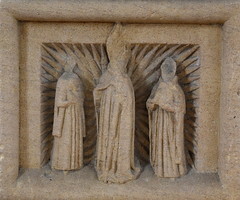 The reason for the anomaly is probably that after the structure of the building was completed, but before the interior was furnished, a college of Priests was established here. For their offices they would need a long, three bay choir. In an archless building like this, the rood structure would always have been built entirely of wood, so it was merely a case of needing to add in a bridge from the rood stair turret back westwards to the third bay, and then across to the rood loft. Certainly much easier than extending the whole building a bay to the east. This has all gone now, of course, but is easy enough to reconstruct in your mind. The Denston rood must have been of a considerable size, and the rood loft system on a grand scale. 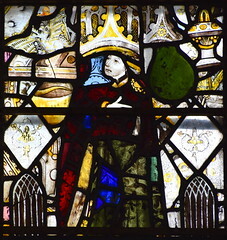 There is a good collection of medieval glass in the east window, although it is entirely a jumble hastily patched together in one of the few 19th century changes to the building. 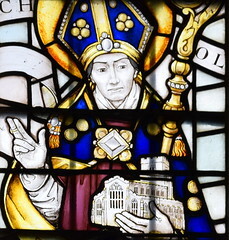 The window was entirely restored along with the others in the 1980s. Unfortunately (and here is a moan) English Heritage will not now countenance the considered reordering of jumbles like this, as they say that they should stand as illustrative of the 19th century restoration. 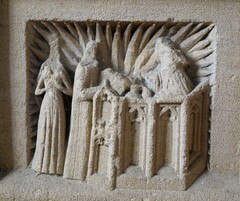 There are a few interesting details, including a woman in bed low down on the left is probably St Anne giving birth to the Blessed Virgin, and other figures, mostly composite and probably donors, although one may have been St Agnes. 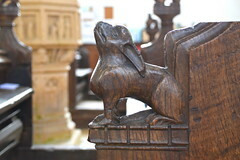 You step through the roodscreen gates into the choir, which is seemly without being elaborate, the animals lifted high on the ends. 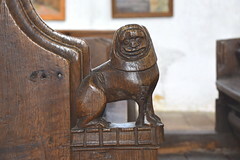 Looking back, there are good misericords, and unusually in Suffolk we are safe in assuming that they came from this church originally. 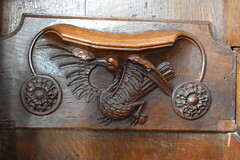 The best depicts a crane holding a stone in its foot. 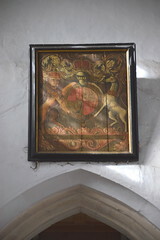 In the floor between the stalls are set the brasses of Henry and Margaret Everard, which Mortlock says form Suffolk's only surviving pair of heraldic brasses. The aisles extend fully the length of the building, and are separated from the choir by delicate parclose screens with curtains. 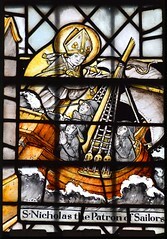 In the south chapel you'll find excellent modern glass by Martin Travers, depicting the church's dedicatee in jolly scenes calming a storm on a boat and raising three little boys in a barrel from the dead, much to the aghast look of the innkeeper. 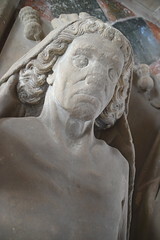 High above are the tabard, helm and sword of a member of the Robinson family, who also contributed the two hatchments at the west end, the tomb chest here in the south chancel chapel, and a wall memorial with an interesting inscription in the north. 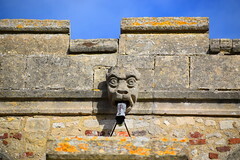 On your way through to see it, however, you will certainly be distracted by one of Suffolk's most grisly memorials. 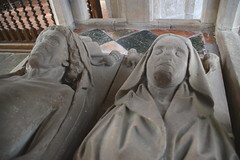 This has had its brass inscription removed, and so the identity is not certain, but they are probably John and Katherine Denston, the founders of a chantry here. 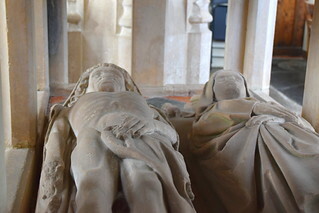 This isn't exactly a cadaver tomb like the one at Bury St Mary, but the two figures lie in their open shrouds, the man's thrown back to reveal his rotting flesh and bones standing proud. The look of horror on their faces is instantly familiar across the centuries. It seems superfluous to detail the modern glass, but as well as that by Martin Travers there is a fine set of early 20th century panels by Heaton, Butler and Bayne in the south of the chancel. They depict the resurrection, and although the figures are lovely (a couple of the women being particularly pretty) the composition is comical to say the least. 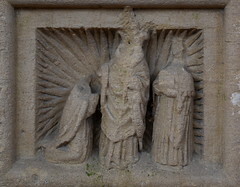 In the bottom panels, the three Marys find the tomb empty and an angel telling them 'He is not here, he is risen'. And where is he? 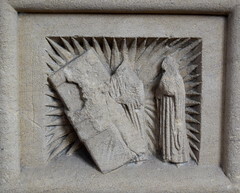 The angel helpfully points to the upper panels where the risen Christ already sits in majesty in Heaven, thus missing out forty days of frantic activity and saving himself the long walk to Emmaus, but leaving poor Thomas in doubt forever. Visitors will come away from this church with a sense of the permanence of stone and the numinousness of glass, which are used to build walls that lift the eye and engage the heart. This is late-perpendicular at its very best, offset by the furnishings given by the Denston family for their college. 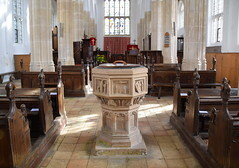 It is useful to compare the church as a piece with St Peter and St Paul at nearby Lavenham, another near-contemporary, and wonder what the church there might have been like without the severe restoration it has undergone. A cautionary note to finish with. As so often in rural East Anglia, the congregation here is now tiny, and has a tremendous burden placed upon it. There is still one service a month, but in the month leading up to my visit, donations to the church in the offertory box amounted to the princely sum of four pounds. One possible suggested way forward is for the village to sell off its hall and use the proceeds to build a new meeting room to the west of the church, joined on to it and providing toilet and kitchen facilities. 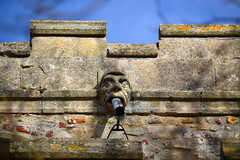 The church, which is perfect for concerts and performances, could then be used regularly for hire, but there is some resistance from villagers to this happening. It is all agonising, for St Nicholas needs more use, it needs more pilgrims and strangers tipping up at its door, its future needs to be safeguarded. Be assured that the parish cannot possibly afford to maintain it for much longer. And yet, for anyone interested in liturgical or Catholic history, this church is bursting with evidence, one of the best resources of its kind in the Kingdom. It illustrates the mindset of 15th century ruling class Catholic orthodoxy, the work of a people with the money to build what the architect le Corbusier might have described as a machine for making Catholicism happen. 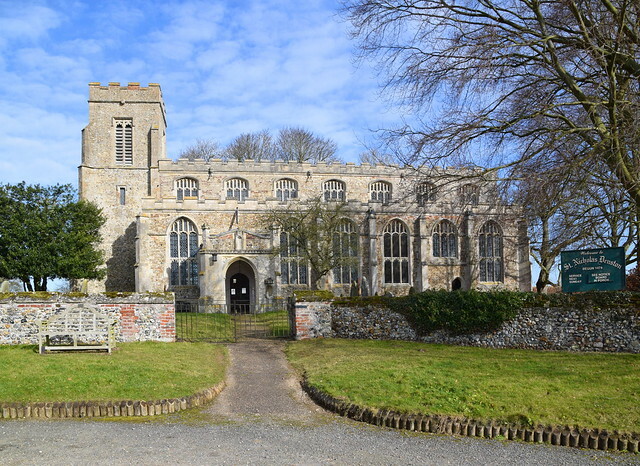 This is probably the least visited of the great East Anglian churches, but is an absolute must for anyone wanting to see one of the best ten or so late-perpendicular churches in England.